Pivotal Labs is the recognized leader in agile software development. They have successfully delivered hundreds of client products, including Pivotal Tracker, their own agile project management software. Their disciplined agile techniques accelerate development, reduce risk and increase responsiveness to market trends. Bring everyone, even distributed teams into the same virtual room. Enable a more efficient way to agree on priorities and stay aligned with the entire team. Get the right product to the market sooner, based on continuous feedback and prioritization. Respond to changing needs and new requirements easily. Stay on target with Tracker's continuous, automatic prediction of milestone completion dates, based on your team's performance. Supercharge your agile project teams with focused, real time collaboration. Accelerate agile adoption with a simple, proven process. 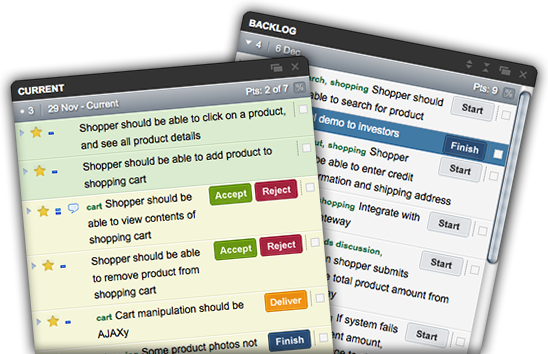 Pivotal Tracker is an easy to use, agile project management tool that brings focused collaboration to software development teams. Built by Pivotal Labs, it embodies proven agile methods, based on experience from hundreds of successful large scale projects. Pivotal Tracker is the agile project management tool of choice for over 490,000 users across thousands of companies, from large public companies to fast growing startups, and open source development teams. From CEO to developer, everyone shares one view. Work at a fine-grained level, without losing sight of the bigger picture. See and react to everything that matters on your project, in real time. Bring your distributed team together. Effective agile software development, from the people that helped invent it. This is agile that really works. Easy to adopt, out of the box workflow that's surprisingly powerful. Transform your productivity. Focus on building great software, not keeping your project management tool in sync with reality. 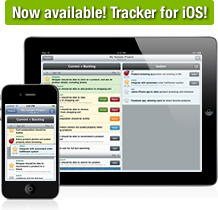 Tracker complements tools and services you already use at your company, and is easy to extend.